I discovered this photo on TripAdvisor today . . . I was very sad as I knew that although cute sloth was destined to die a few days after the photo was taken. The tourist was excited because sloths are not typically seen in the jungle. But they were not aware of the fate that awaited this baby sloth. When I visited the Napo Lodge, our guides took the time to stress that we NOT support the locals by paying to take photos of captive animals. 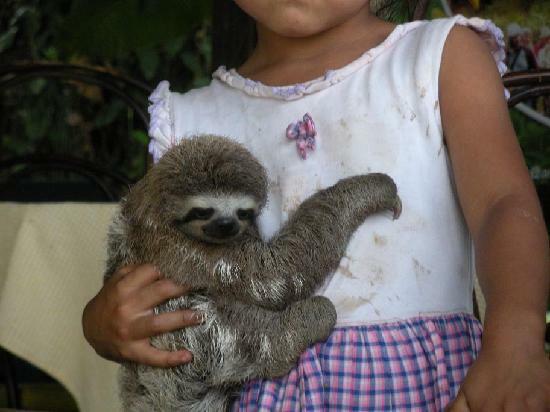 Unfortunately, a little girl holding a cute baby sloth is irresistible to tourists with a camera. One of our tour group begged to take our riverboat ashore where a little girl shouted to us . . . "Photo for a dollar!" First our guide ignored the pleas and then the number of members of our boat joined to chorus of pleas to stop the boat. Our guide expressed concern that we would miss seeing the Hoatzin birds as the later the time of day we arrived near their nests, the more likely we would miss seeing these rare birds. When our boat returned from our Hoatzin adventure down the same blackwater river we had arrived by, the pleas to return to the shore in search of a photo of a sloth increased. Once again our guide simply shook his head no then the voices expressed disappointment for missing the rare opportunity. Suddenly, our guide stopped the boat mid-stream and turned to face us. He looked angry but he remained calm. Slowly he told us that the locals venture into the jungle to capture a baby sloth. Sloths sleep up to 20 hours a day and rarely come down from the rainforest canopy. Baby sloths cling to their mother as she hangs upside down in a tree. The locals will often kill the mother in order to capture the baby sloth. They send their children with the sloth since they know that tourists cannot resist the opportunity to photograph a cute local child and baby sloth. They ask for a dollar, a pocket knife, or something of value in exchange for the photo. Unfortunately, the baby will refuse food and water . . . surviving only a few days before it dies. If the local people discover that tourists will not buy a photo of the captive animal, they will not return to the Amazon Rainforest to capture another animal. Remember that the the Sloth is an endangered animal and should not be exploited for the simple intention of capturing a photo for your scrapbook or blog. Be a responsible traveler and refuse to participate in this "circle of death." The rhino are under attack in today and they need our help. We can help fund efforts to save the rhino and have fun at the same time. Please check out the game for your SmartPhone . . . it is available for both the iPhone/OS system and Android system. Black Rhino is also known as the hook-lipped rhino. Their lip is very helpful as they are browsers, eating bushes, shrubs, and lower branches of trees. Their scientific name is Diceros Bicomis. It is found in Botswana, Kenya, Malawi, Namibia, South Africa, Swaziland, Tanzania, Zambia, and Zimbabwe. The Black Rhino is Critically Endangered with only 5,055 left today. The White Rhino is also known as the square-lipped rhino. The white rhino is a grazer, eating grasses and other ground vegetation. Their scientific name is Ceratotherium Simum. They are found in South Africa, Botswana, Kenya, Namibia, Swaziland, Zambia, Zimbabwe, and Uganda, At one time the white rhino was critically endangered with only 50 left in the wild. Due to conservation efforts, the white rhino is now considered to be "near threatened" with 20,000 in the wild today. The Sumatran Rhino is also known as the hairy rhino. The scientific name for the Sumatran Rhino is Dicerorhinus Sumatrensis. This species of the rhino is found in Sumatra (Indonesia) and Sabah (Malaysia). Unfortunately, is Critically Endangered with fewer than 100 left in the wild. The Sumatran Rhino species is older than any other mammal on earth. It would be a real shame to lose this species. The final project in my PRT 5610/6610 International Tourism course required the students to create an infographic or video to conclude the public awareness campaign. I would like to share with you one video created by Sean McKenna. I commend him for his adventure into the world of video. Check it out right here or on YouTube.com . . . The top news story for April 24th features Lily Tomlin "speaks for elephants." no registration required ~ Free! TripAdvisor Launches GreenLeaders, Just in Time for Earth Day - Find more articles like this at the Resort Manager's Digest. Today, the Salt Lake Tribune featured a story entitled Art meets Activism on the cover of "The Mix" section of the Sunday paper. The story recounted the efforts of Ronny Edry, an Israeli graphic designer who has his students at the Salt Lake Community College how to create a poster to communicate a message to further cross-cultural understanding. An excellent illustration of how modern technology makes it possible for students to create a high quality poster that can be used to educate people via a variety of social media platforms. This is very similar to the infographic assignment in my International Tourism course. I require the students to create a poster to communicate a "Call to Action" to save an endangered species, endangered places and/or effect a difference in any number of environmental awareness topics. Check out the excellent infographic created by one of my students this past week. This infographic was designed by Krystal Schultz. If you are interested in making a difference in saving the tigers from extinction, why not check out the suggestions on Krystal's blog. This pelt of a clouded leopard. The clouded leopard is vulnerable of becoming extinct due to poaching and habitat destruction. The beautiful coat of the clouded leopard is very unusual and some people believe the coat and their teeth have special powers to heal. Therefore, some people still hunt the animal even though it is illegal. The clouded leopard is protected and it is illegal to sell or possess the pelt, teeth, paws, or other parts of the clouded leopards. If you attempt to bring some part of a clouded leopard into the United States, you will be arrested for violating the United States Endangered Species Act. If you are found guilty, you will be fined not more than $50,000 or imprisoned for not more than one year, or both. 1- Learn about the clouded leopard and spread the word to your family and friends about the need to save this beautiful creature. You can be an advocate for the clouded leopard by speaking up for their conservation at community events. The Defenders of Wildlife has several options dependent upon your ability to assist. You can adopt a cloud leopard for $15, $45, or $60. The Clouded Leopard Project has several options, such as, the Clouded Leopard Protector ($50), the Clouded Leopard Crusader ($100), the Clouded Leopard Conservator ($150), and the Clouded Leopard Adoption package for $250. If you have the funds, a $500 donation will support a camera trap to record the behaviors of cloud leopards in the wild. The Clouded Leopard Project welcomes contributions of any amount and provides information regarding fundraising events to help save the clouded leopard. Other alternative options include donating goods and services, purchasing through their website link to Amazon.com they will contribute 5% of the total sale to the Clouded Leopard Project. Palm oil plantations are a common threat to the rainforest habitat of the clouded leopard. As the demand increases for Palm Oil, the threats to the existing lands only increases. If you will take the time to examine the label of the palm oil container you can ensure that you only purchase certified palm oil. Many of the food products that we eat are made with Palm Oil. Look for this symbol on the label before buying. The full list of food brand names of companies that use Certified Sustainable Palm Oil can be obtained by visiting the Point Defiance Zoo website. Clouded Leopard - What beautiful eyes you have! The beautiful eyes of the clouded leopard help the big cat to hunt at night. Their eyes are different from any other wild cat's eyes. The pupil of the clouded leopard do not get as round as other big cats. Neither do the clouded leopard's pupil shrink to narrow vertical slits that other big cats. The clouded leopard is a good swimmer and it is believed that this is how the clouded leopard reached small islands in Vietnam and Borneo. Clouded Leopard - Oh my, what large teeth you have! Clouded leopards have the largest canine teeth relative to their body size of all large cats. This excellent photo was taken by Nikographer and posted on Flikr. The Clouded Leopard should not be confused with leopards as they are two different species. The clouded leopard has some very important differences from leopards and many of the other members of the wild cat family. The clouded leopard's skull has a very different structure from the common leopard. The clouded leopard can open their mouth wider than any other cat species. As you can see in the photo above, the clouded leopard has some very impressive teeth. In fact, they have the largest canine teeth relative to their body size among all the large cats. The canine teeth of a full grown clouded leopard average 2 inches in length, about the same size as the tiger's canine teeth. Very impressive when you know that the tiger is almost 10 times the size of a clouded leopard. If the clouded leopard lives in an area where other wild cats live, such as tigers and common leopards, then they hunt at night (nocturnal) and live among the trees (arboreal). In areas where the clouded leopard does not compete with other wild cats for food, they spend more time active during the day and hunt on the ground. Clouded leopards are the best climbers among all wild cats. There is a very important reason that clouded leopards can climb so well. Yes, they have a long tail (longest in proportion to their body size for all wild cat species) designed to help them balance, but they have very unusual ankles. Imagine that you want to walk backwards, it would be very difficult because our toes remain facing opposite our heels. Imagine how much easier if our ankles could rotate . . . like the clouded leopard. Their flexible ankle joints can rotate backwards allowing these talented climbers to climb down along branches and climb down tree trunks headfirst. They can even hang from a tree using just their back paws allowing their front paws to catch or hold their prey. The Clouded Leopard is rarely seen in the wild, so much of what we know of these beautiful creatures is based on those that live in zoos. The video above featured two young cubs at the San Diego Zoo. Did you learn some new facts about the clouded leopard? Why does the Clouded Leopard have a long, thick tail? Because it helps them to maintain their balance as they climb trees and jump from one branch to another. Their tail is as long as their body, so if the Clouded Leopard is 3 feet long then their tail is also 3 feet long. They are not the largest cat species, but they are not the smallest wild cat. They are unique because they can meow like a small cat species and they can growl like a large cat. Height: 10-16 inches at shoulders. Length: 2-3 feet ( plus their tail also measures 2-3 feet). Weight: Males average 45-60 lbs; females average 25-30 lbs. This is the greatest difference between male and female weight among the wild cats. Lifespan: We do not know how long Clouded Leopards live in the wild, but we think they can live 11 years. We know that Clouded Leopards in captivity have lived up to 19 years.